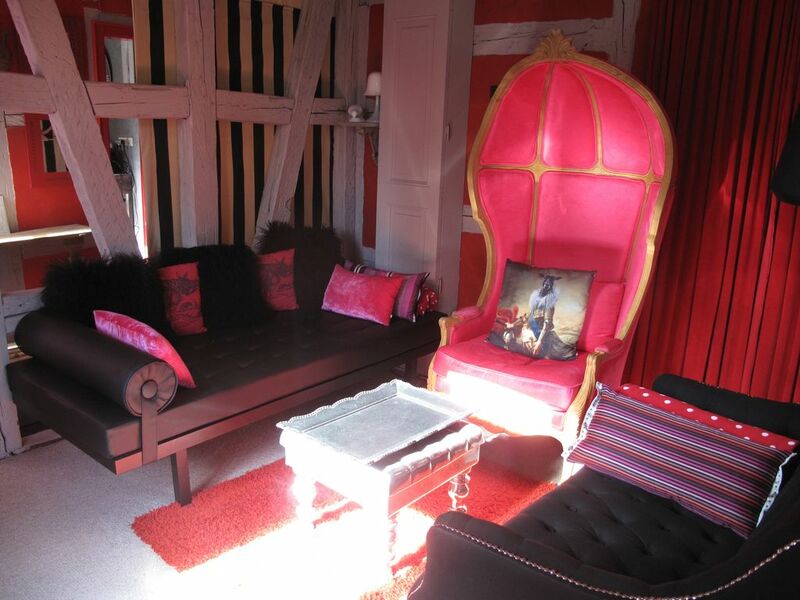 Elegant, cozy apartment in the historic site, 2 to 4 people. Charming apartment of 55m2 in a half-timbered house of the 17th century, in the heart of the historic district of Strasbourg 'la Petite France'. Possibility of a 3rd bed (1 person bed in the living room), possibility of providing a mattress 1 person for a 4th sleeping (to ask the ground in the living room). Baby: 1 high chair and cot available for baby. The flat has 1 salon, 1 ch. bedroom, 1 entrance, 1 kitchen, 1 bathroom. Very bright! The living room is separated from the bedroom by slatted beams and thick velvet curtains. The living room, room to live and dream, whether in the coach chair, lying on the couch in the cushions or around the majestic table breathes calm, beauty and serenity. You can even see the cathedral by the east side window. The bathroom is colorful and fun, and has a window that overlooks the west. The bedroom is a cocoon of soft and relaxing colors where the bed is an invitation to daydream and rest. (size of the bed: 1m60 x 2m, thickness of the mattress: 20cm). The location of the apartment is also a real asset because located 2 minutes walk from the hyper-center. It is therefore possible to alternate walks and rest several times a day, without the worry of walking too much. Located in a pedestrian area, no inconvenience related to car traffic will bother you. A detailed book of my best addresses (restaurants, tea rooms, caterers, organic supermarket etc ..) is available with map of the city. Books on Strasbourg to consult. The bathroom has a west-facing window. There is a bathtub, toilet, sink, shelves, 2 small tables, an electric heater, an old mirror, magnifying mirror (7X) for makeup and shaving, and baroque sconces above the sink. There is a hairdryer and multiple bars to extend the towels there. These are provided. The tile is a black and white checkerboard, and the furniture is red, copper and marble. Ironing board + iron available. The kitchen (facing south) has a refrigerator + freezer, a microwave oven, two electric burners, a sink, a Nespresso machine, a filter coffee maker, toaster, kettle, 1 high table and 2 high chairs, all the dishes to cook for 4 people, new furniture storage (October 2010). Although we loved Strasbourg staying "home" was almost as enjoyable as going out. The apartment has windows over three sides - looking onto the canal, a square and a laneway. We even fed ducks from one window. Nathalie provides many little extras and is on hand to help with any enquiry or request. I am very happy that you enjoyed your stay! You are welcomed when ever you want. Wish you a wonderfull winter! Those 4 days in that apartment in Strasbourg were enchanting. It was extremely poetic, as if we were transported into an imaginary world. The decor was like being in a fairy tale, the welcome was warm, and the comfort was excellent. Also, the location is ideal, because the surrounding view is idyllic. And because it's centrally located, we were close to the cathedral, the shops, and the museums. Having breakfast offered on the first morning was a wonderful plus, which enabled us to fully take advantage of our first morning there, while we enjoyed the view of the sunny park. Looking forward to another stay in Strasbourg! Thank you for your kindness; I'm very happy to see that you enjoyd the appartment. I hope it will inspired more visitors like it did for you! Wir haben eine sehr schöne Zeit in diesem schönen Haus mit dem außergewöhnlichen Appartement erlebt. Wir wurden sehr nett empfangen, und haben viele Tipps für die Stadt bekommen. Das Appartement liegt mitten im Zentrum, so konnten wir alles zu Fuß unternehmen. Wir haben uns sehr wohl gefühlt und kommen immer wieder gerne. Ganz toll dass es ihnen so gefallen hat! Und es würde nett sein ihr zwei wieder zu sehen. Herzlichen Grüssen ! Im Juni 2018 verbrachten wir vier Tage in Nathalies wundervoller Wohnung. Die Wohnung liegt in Petite France - einem der wundervollsten Viertel Straßburgs, sehr zentral - wir konnten alles zu Fuß erledigen - genau, wie wir es wollten! Man schaut von der Wohnung aus auf den Fluss in einen idyllischen Park hinein, oder auf einen Platz mit tollen, charmanten, leckeren Restaurants...! Auch die Innenausstattung der Wohnung lässt nichts zu wünschen übrig - wir als Kleinfamilie haben uns außerordentlich wohl gefühlt! Nathalie hat wirklich an alles gedacht - sei es genügend Kaffeekapseln, oder Handtücher....die Betten waren super bequem. Nathalie hat uns sehr herzlich begrüßt und uns viele, hilfreiche Insidertips gegeben - nochmals danke für alles! Wir hoffen, wir können bald wiederkommen! In june 2018 we Lied for four days in Nathalies wonderful appartement. The appartement ist in Petite France, one of the most wonderful areas of Straßburg. The house ist placed directly next to a river, and you can look over the river into a beautiful park. Or in a place with nice restaurants. Wonderful. We found everything we needed in the appartement. And we enjoyed our time really. Nathalie really thought about every little detail, and we found everything we needed in her appartement. We slept very well. Nathalie was very heartful and had so many helpful ideas for us, what to do in our few days! Thanks a lot, Nathalie. We hope to be back soon!! Wunderschöne Ferienwohnung mit liebe zum Details. Die Lage ist einzigartig, direkt in Petit France und am Wasser. Blick auf den Münster und auf den Park. Für uns die schönste Ecke von Straßburg am Rande des Innenstadt Rummels und doch so zentral. Parkhaus zwei Minuten zu Fuß, daneben gleich das Museum. Wir kommen wieder wegen dem wunderschönen Straßburg und hauptsächlich auch wegen der super tollen Unterkunft. The apartment is located in the heart of historic Strasbourg, classified cultural heritage by UNESCO, in a pedestrian area. It is set on the 2nd floor of this 4-storey house dating from the seventeenth century. The first trade is 20M. The cathedral is 700M, 500M to the station, the first Christmas market at 150 M. The very center of the town is 2 minutes walk. The apartment is bright, has 7 east and south facing windows. Golf: 4 different golf courses within a radius of 30 kms. Le paiement peut se faire par virement bancaire via le site. Autres possibilités : -si la réservation se fait au moins 1 mois à l'avance, un contrat vous sera envoyé, je vous demanderai de me le renvoyer rempli et signé, accompagné d'un virement (ou chèque pour les français ) pour les arrhes ( 30% du montant total). - si la réservation se fait à moins d'1 semaine de la date d'arrivée, le paiement total doit se faire par virement bancaire.